As I've mentioned before, I do love to Role-play. I enjoy setting a story behind the characters I play, and the Twenty Totems would be no different. I just finished reading Rise of the Horde, by Christie Golden. And excellent story about the downfall of the Orcs, as told by a "present day" Thrall. It's entertaining, and inspiring. The book does an excellent job of conveying Thrall's regret for the choices his people made, even before he was born. It also shows the true "spirit" behind both Shamanism, and the terrible Warlocks they became. These days, Warlocks are kept around out of nessesity, while Thrall's true wish would be that every Orc would seek the ways of the Shaman. So there's my story. 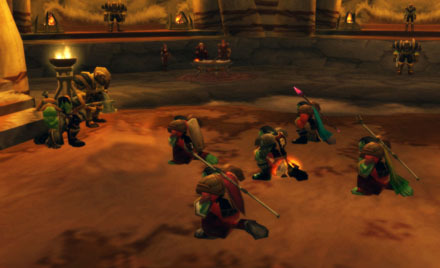 The Twenty Totems are an elite group of young Shaman, who were trained in the Shamanistic Arts by Thrall himself. They were put together, and charged by Thrall to be an inspiration to the Orc race. A group the Orcish children could aspire to be. Heros. Anyways, tonight I finally created their guild, (Twenty Totems of course), and celebrated by taking a moment to meet Thrall. It was good fun, and I drew a small crowd in the process. 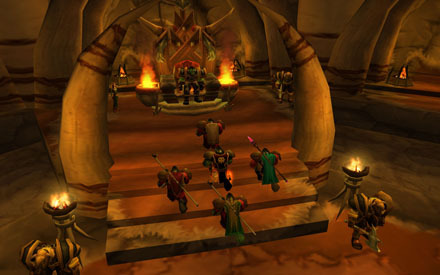 We then followed Thrall up to his throne to recieve our orders, then headed out to spread the Shamanistic Arts. It feels official now that we're wearing our guild tag. So far this multiboxing thing has been incredibly fun. I just can't wait to get them to 45, where they'll join the 5th Shaman, and we'll finally be a pvp team. Never Five-Box PvP in the Teens... Ever.